The Sacha Lodge • Use the form below to contact us directly. 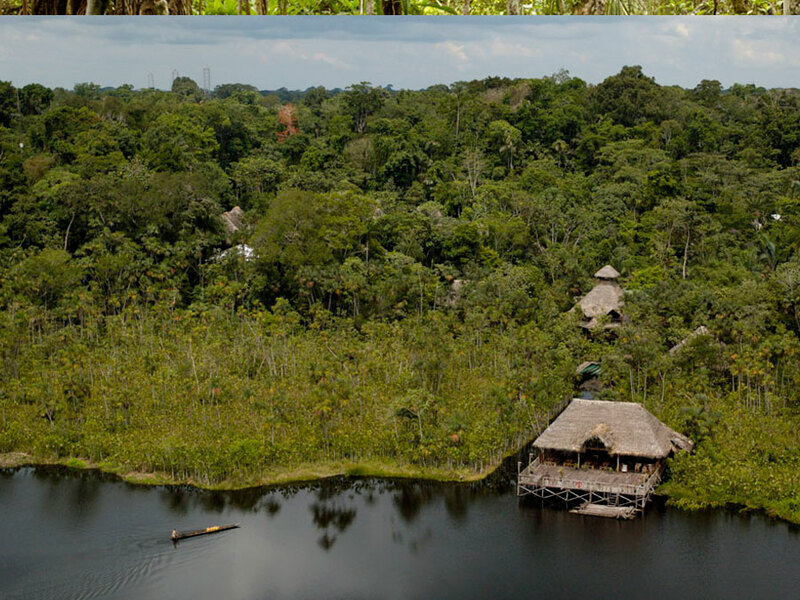 Fill in the fields to check availability & reserve direct with The Sacha Lodge. 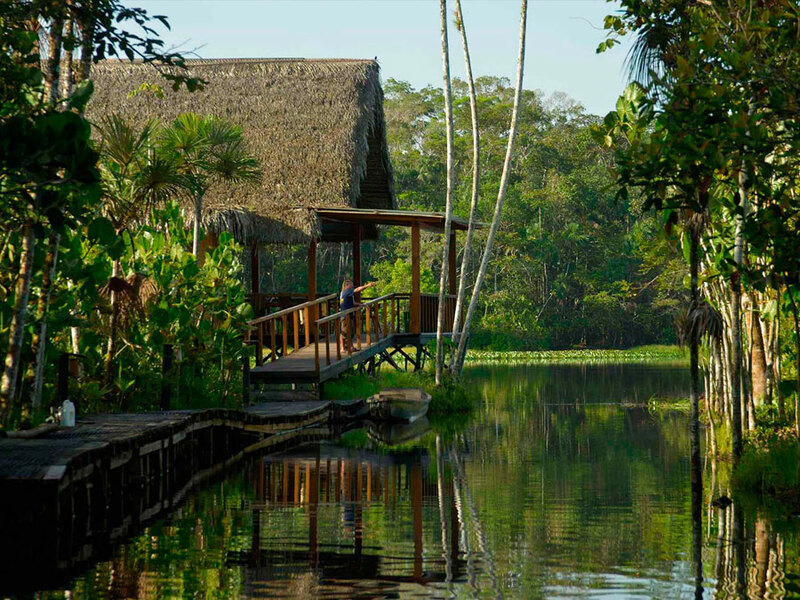 Located in a 5000 acre private ecological reserve, Sacha Lodge provides a safe and comfortable base for you and your family to enjoy the Ecuadorian Amazon Rainforest. This was a wonderful experience. Not a detail was missed and the small touches were absolutely noticed (For example cushions in canoes). Food was excellent! Both our guides were wonderful and very personable. 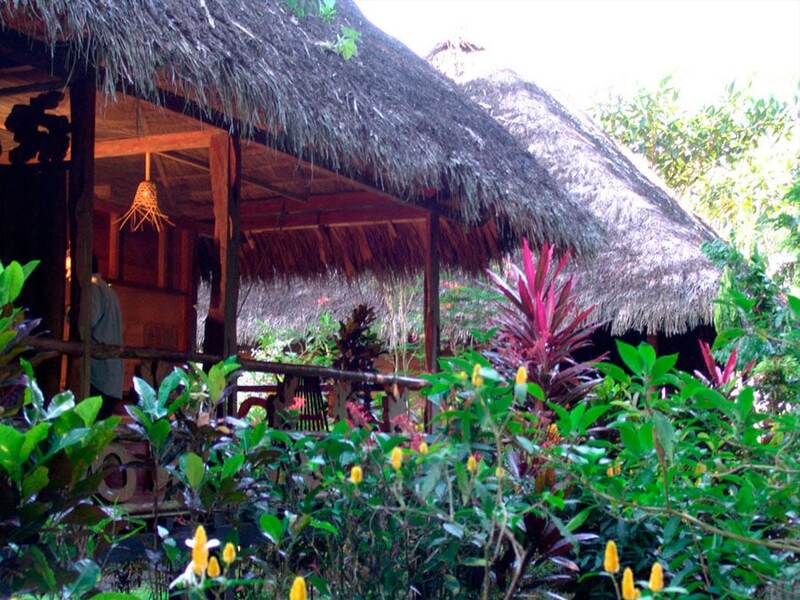 We will certainly recommend Sacha Lodge! 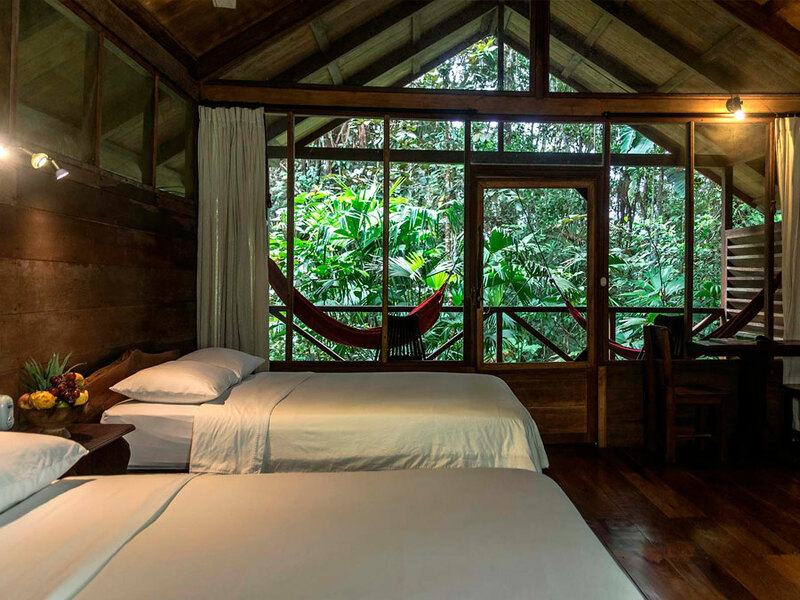 On our Sacha Lodge Amazon tour, explore the forest on rainforest walks, canoeing the lake, visiting the Yasuni parrot lick, and walking high in the trees on our 940-foot (275-meter) long canopy walkway. The walkway is a great place to spot some of the thousands of colorful birds. As this is a private reserve, the wildlife is well protected. 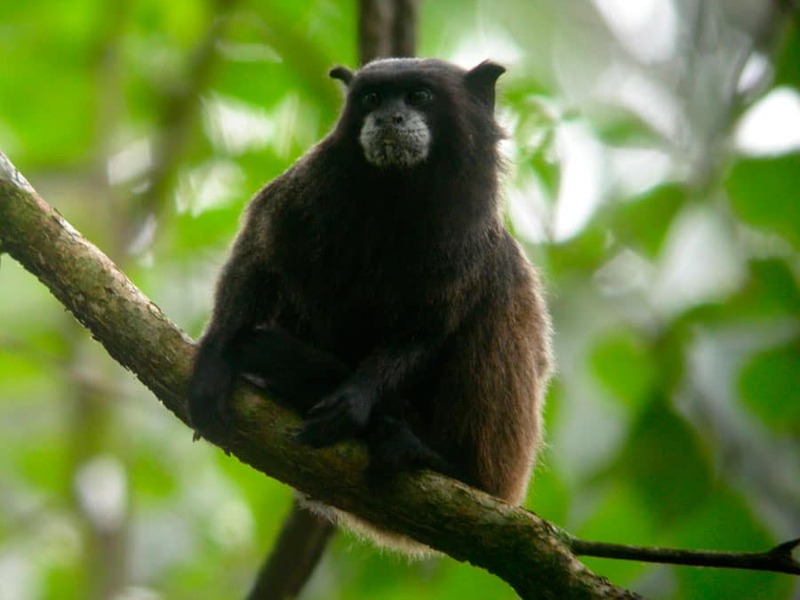 It’s not uncommon for different monkeys to even play on the boardwalk or cross through the canopy over your comfortable accommodation. 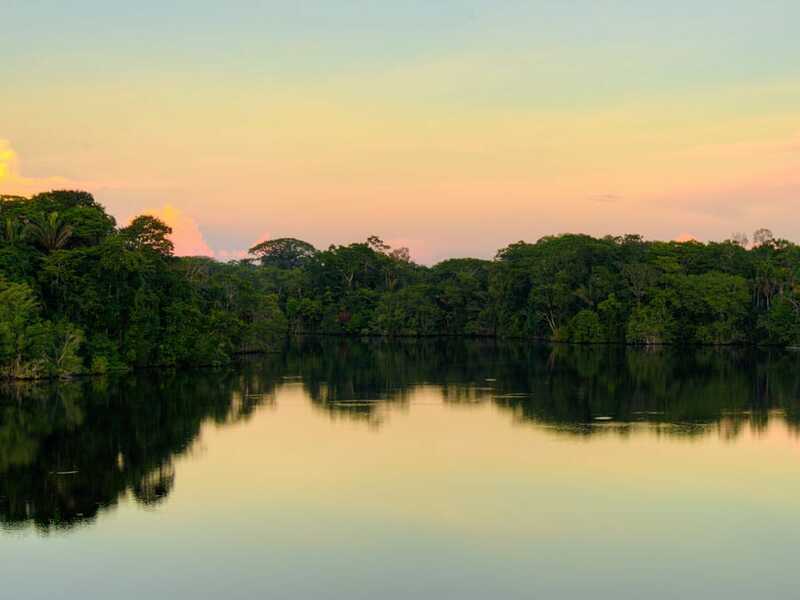 Enjoy delicious food with both restaurants available, the Sacha Lodge butterfly house, and miles of trails to show off the best areas of this incredible section of Amazonia. We have had an amazing stay at Sacha. The whole organisation was efficient. We would recommend Sacha to anyone –young, families, students. Our guide really made the trip special. 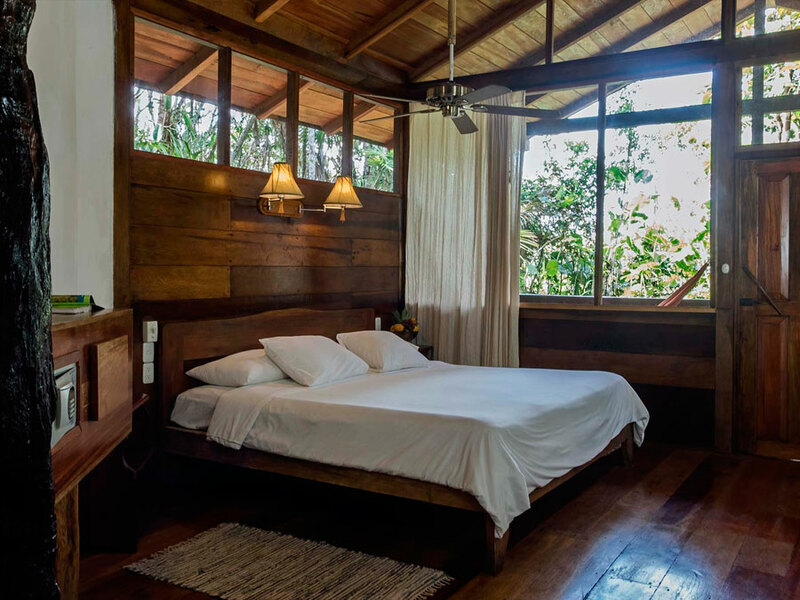 The Sacha Lodge was carefully constructed to blend in with the environment yet offer a little comfort in the rainforest. 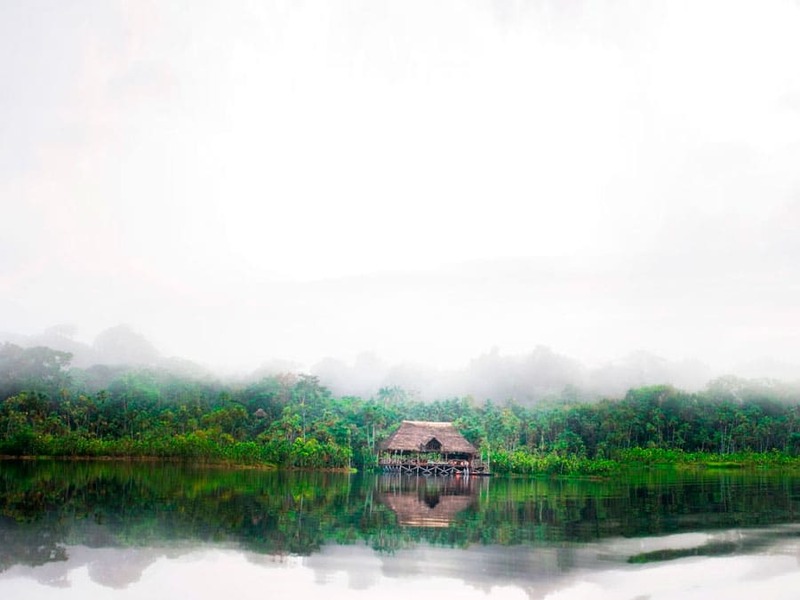 Sacha Lodge cabins are designed in a traditional style with thatched roofs and shaded terraces nestling in with the Amazon Rainforest. 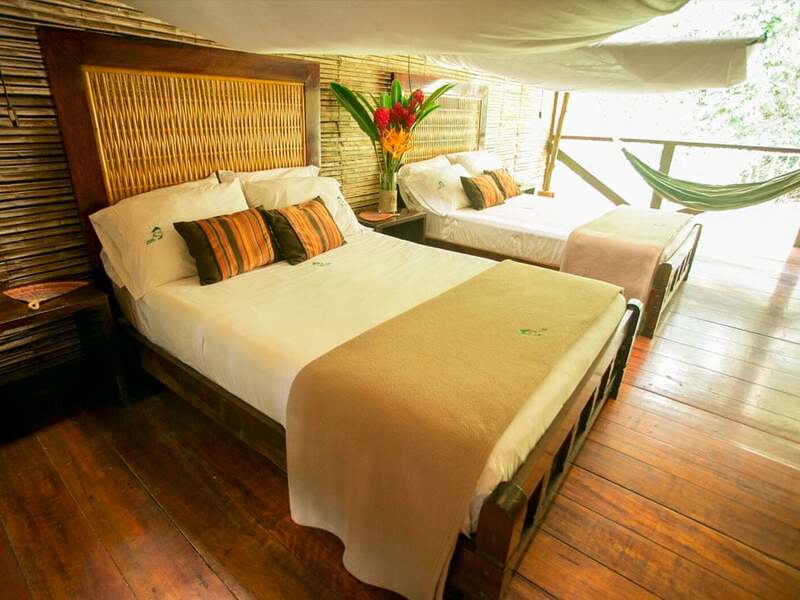 Sacha Lodge has 26 rooms, including single, double and (upon request) triple accommodations. 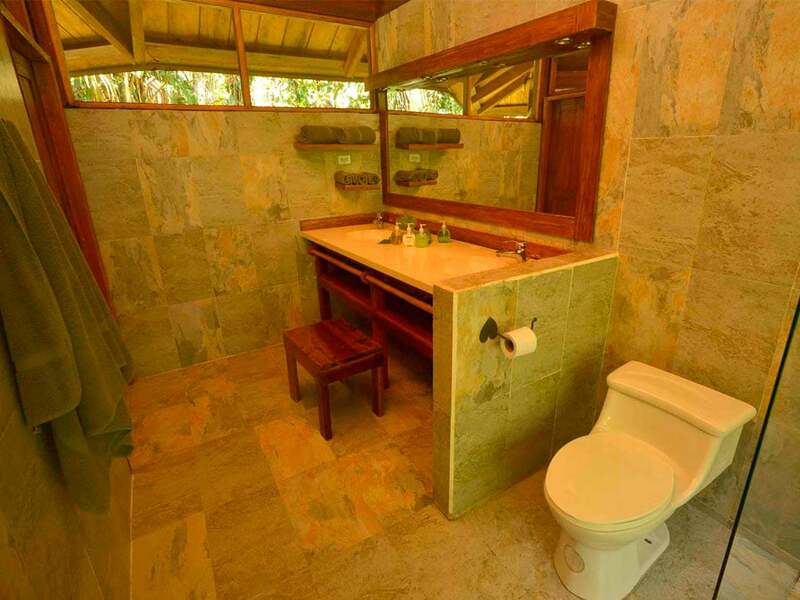 All bedrooms contain a private bathroom with flushing toilet and hot shower. The cabins are protected with insect netting and come with ceiling fans above two comfortable double beds to keep you comfortable on your stay. 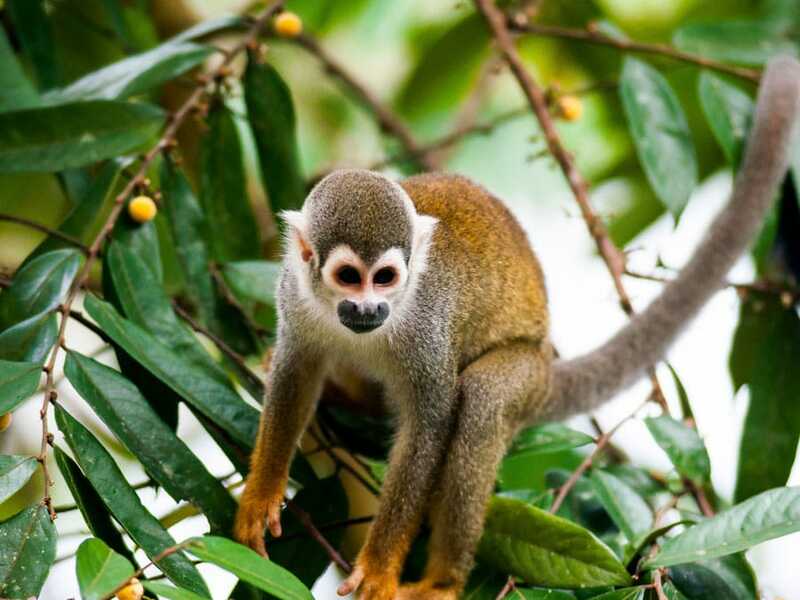 During free time, visitors often report seeing toucans, agoutis and monkeys from their own cabin. Guests may also enjoy a raised lookout above our main bar and lounge, which offers a scenic view of Pilchicocha Lake and excellent opportunities to birdwatch. Excellent experience, loved the organization plus activities. I appreciated that my vegetarian choice was well taken care of each meal. 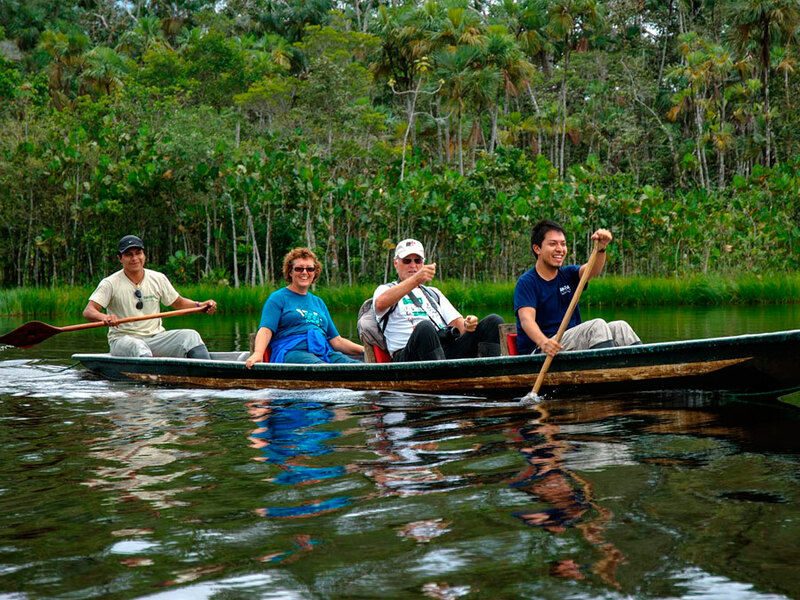 On your tour, you will explore the Amazon Rainforest with your group and naturalist guide. 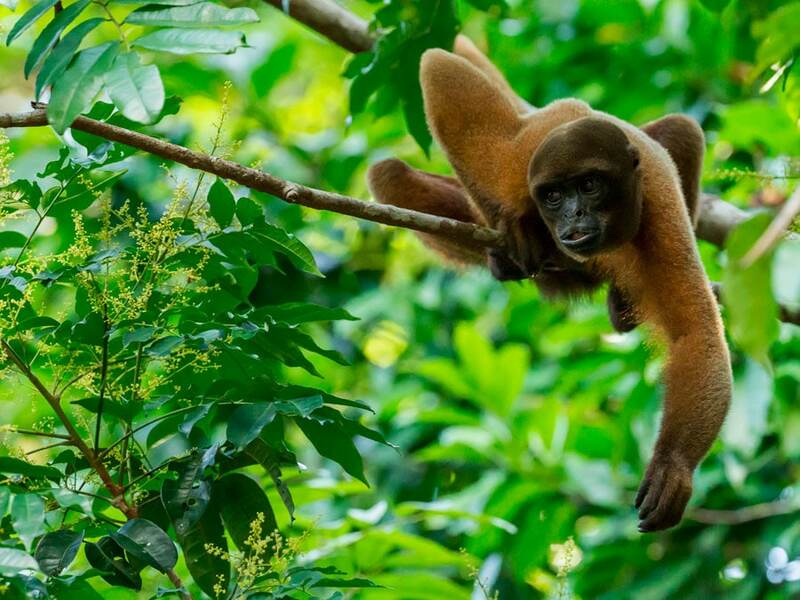 Enjoy finding and learning about the animals, plants and trees of Amazonia on forest walks, canoe tours, walks across our canopy walkway, and visits to the Yasuni clay lick. 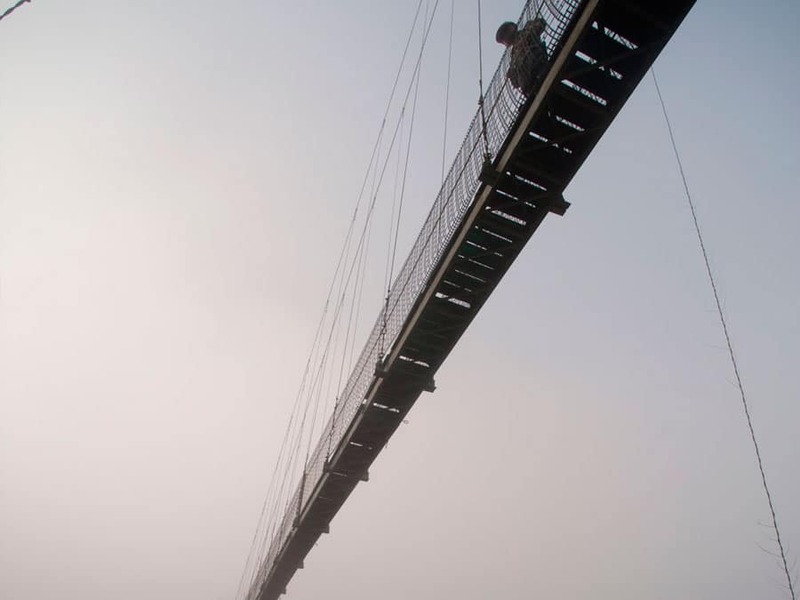 One of the favored features of the lodge grounds is our 940-foot (275-meter) long canopy walkway, which stands 94 feet (30 meters) above the ground. 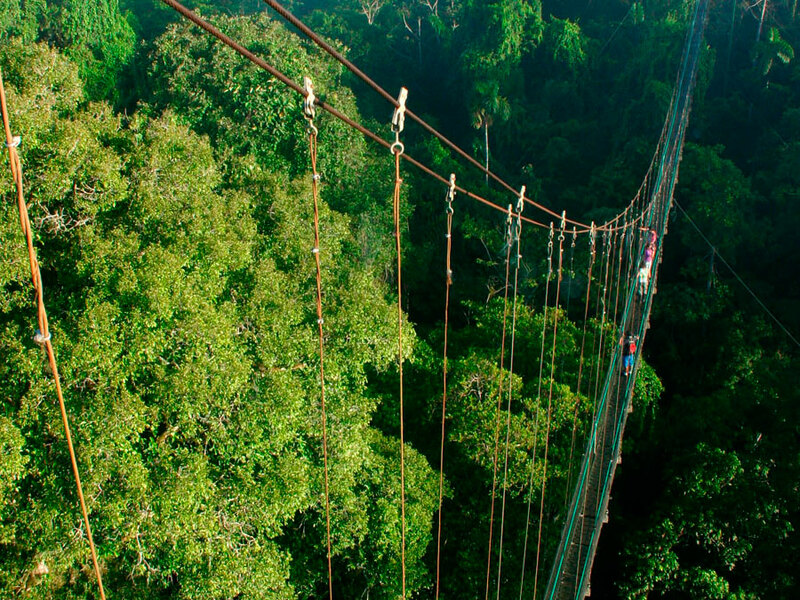 Here you can explore the rainforest from a unique perspective and spot colorful birds of the canopy. 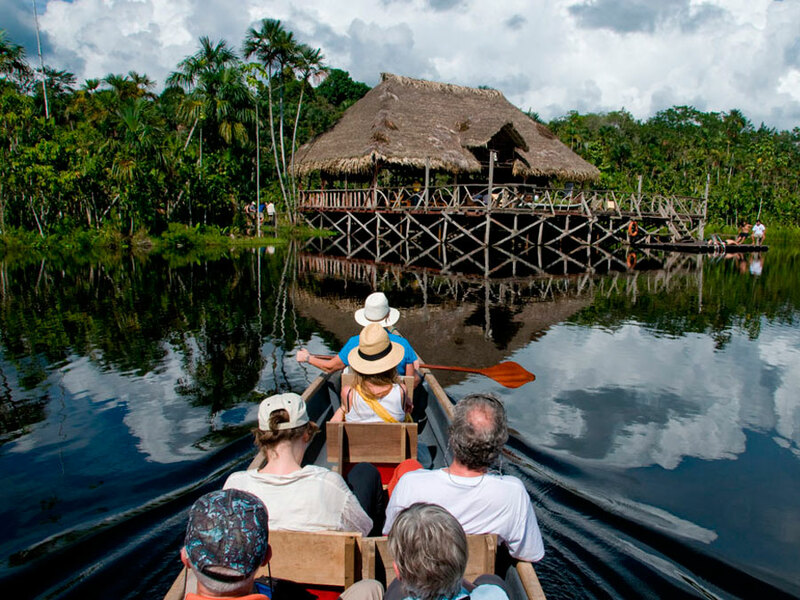 Another of our favored activities is a visit to the Yasuni parrot lick. 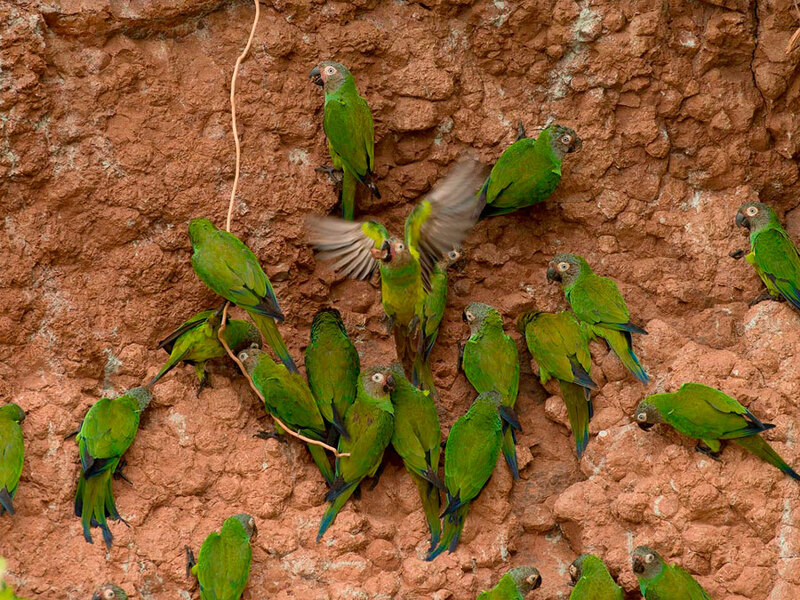 This is an exposed area of clay where hundreds of parrots come to feed on the medicinal clay to help detoxify foods they have eaten in the forest. 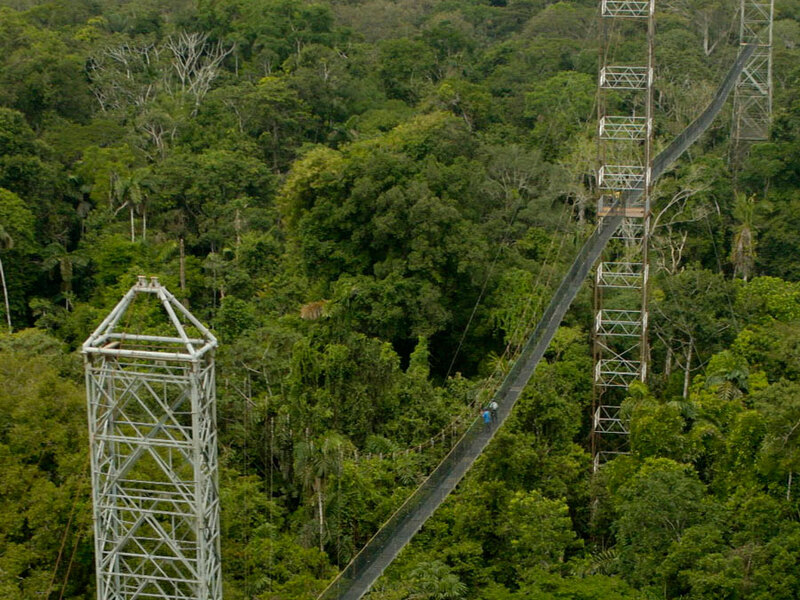 In addition to the canopy walkway, you can also enjoy the 135 foot (43 meter) observation tower to see the rainforest from a different perspective. Built around a large kapok tree, the tower gives magnificent view of the surrounding area. 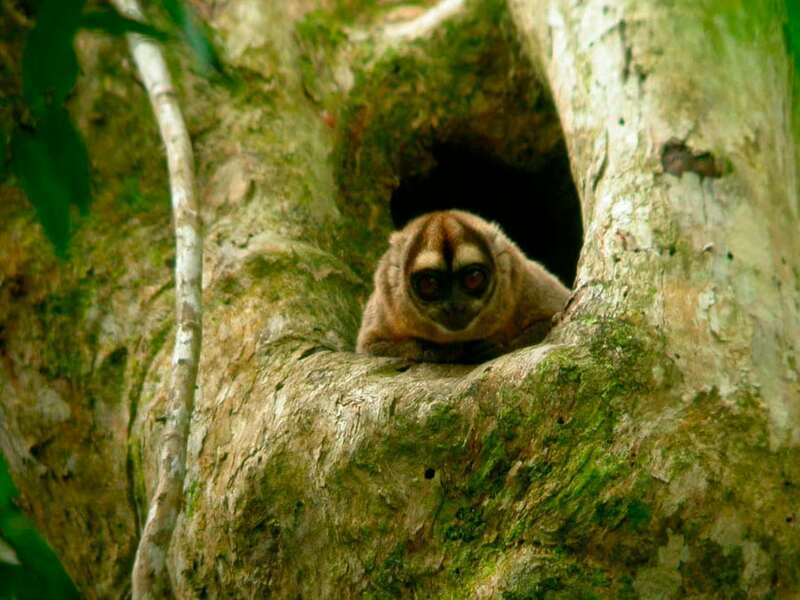 You can see many different animals and birds, and a visiting ornithologist spotted 80 species in a single morning. 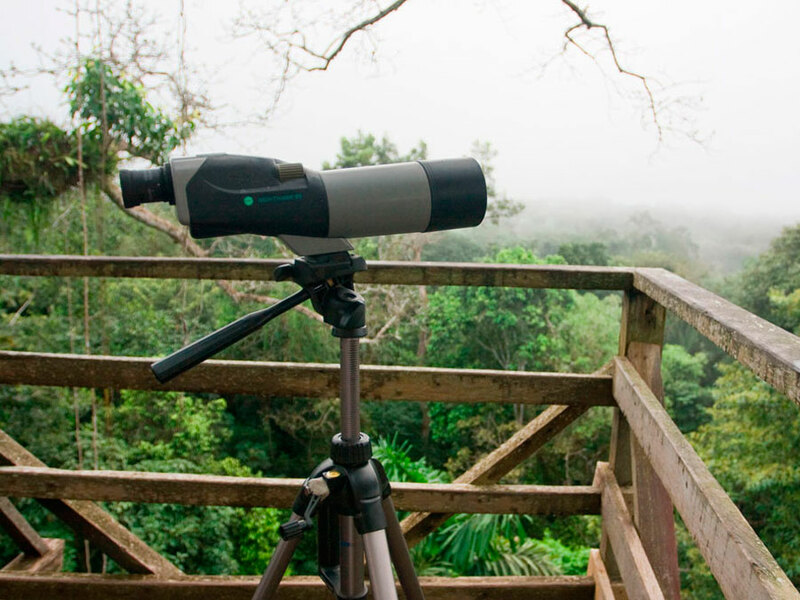 Of the incredible 1600 bird species registered in Ecuador, 587 (37%) have been seen at Sacha Lodge. 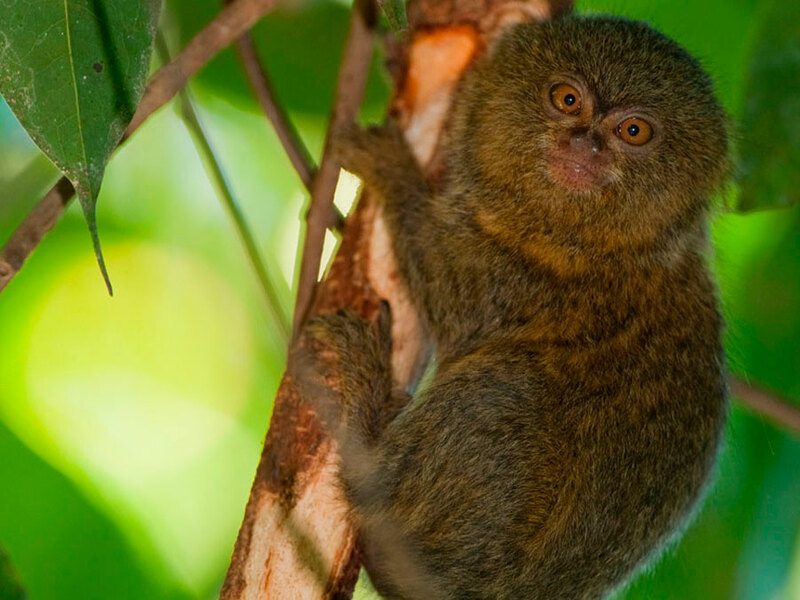 That’s almost 7% of the species found in the entire world! 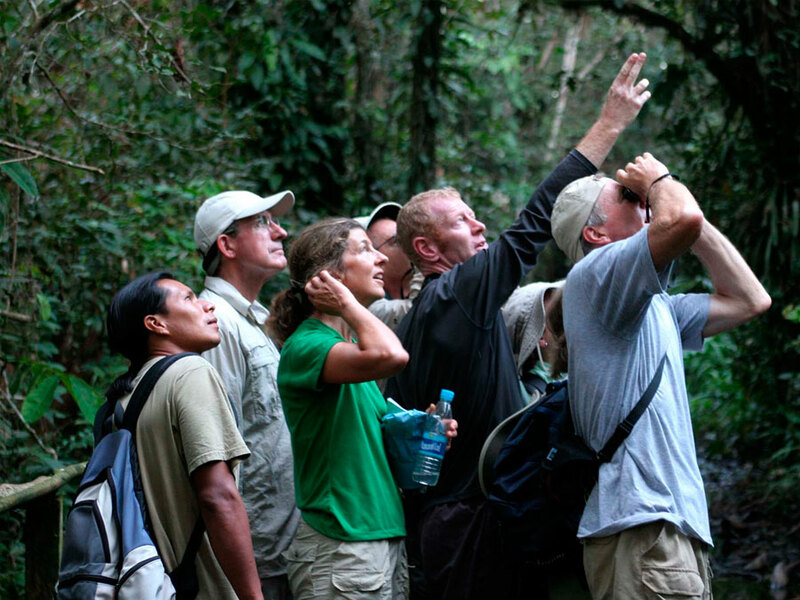 If you have a particularly passionate interest in birds, we can offer our Sacha Lodge birdwatching program. 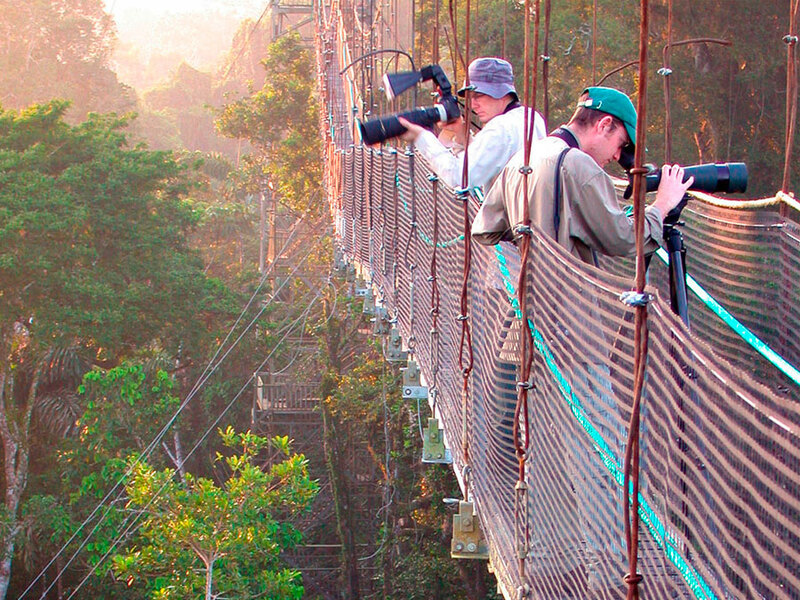 The journey to Sacha Jungle Lodge begins in Quito, Ecuador’s capital city. 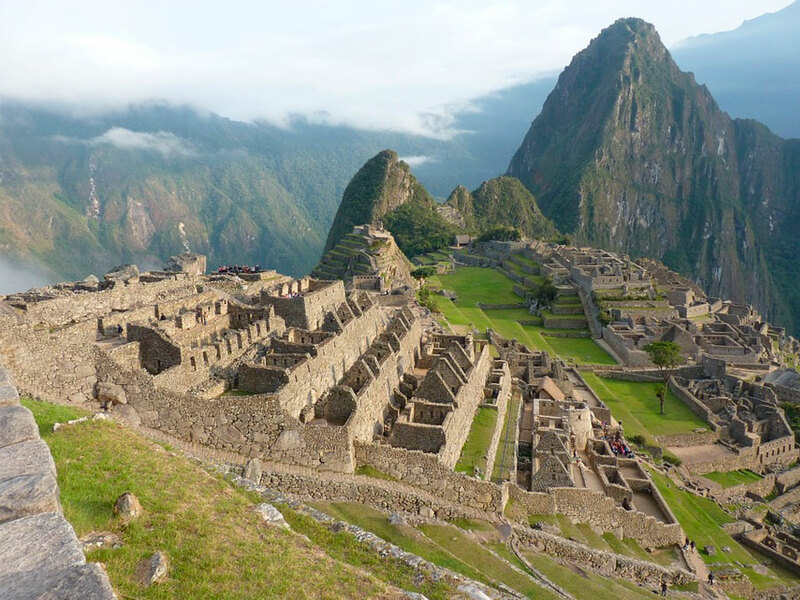 From here, a 25-minute flight takes you over the Andes Mountains’ majestic snow-covered peaks and down over 8500 feet (2600 meters) into the Amazon Region. The flight destination is the port town of Puerto Francisco de Orellana, locally known as Coca, where you will be met by a bilingual guide and taken to a private dock. 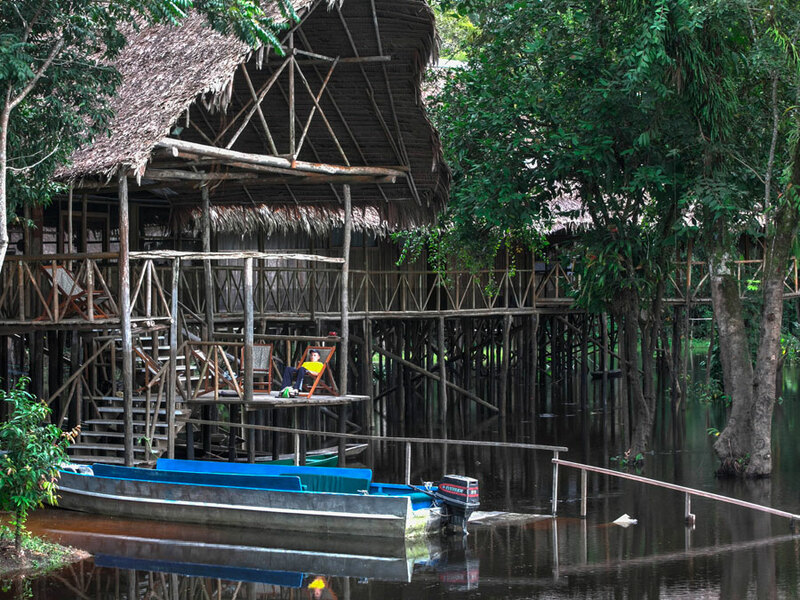 Here we will pause for a snack and to use the rest rooms before boarding our covered motorized canoe for a 2-hour, 50-mile (80-kilometer) trip down the sediment-rich waters of the Napo, the largest river in Ecuadorian Amazonia.